It finally happened. We made it five days this year – five whole days – without anyone in our office referring to the current year as 2018. Which is surprising, considering last year was filled with so many ridiculous and unforgettable things, even if there’s a lot we’d just as soon forget. One awesome thing to come from 2018 was the Mahindra Roxor, the Willys successor we didn’t know we needed. Mahindra has already rolled out improvements for the 2019 model year, and they’re fully intent on keeping the Roxor modern for as long as possible. That hasn’t stopped modders from pushing the Roxor’s limits, tuning ECUs and adding lifts, wheels, and diffs to take the Roxor to its final form. The holidays have come and gone, but the new year is just getting started. Mahindra Roxor Aftermarket Parts: Our Store Has Expanded! There are some epic parts featured in this week’s edition. From windshields that are better than OEM, to ECU tunes that make a stock Roxor look like it’s standing still, to wheels and accessories that will make your Roxor stand out from the crowd, you can find it all in our Roxor Store. If you’re new to the Roxor for 2019, this overview video by youtuber Tyson is a great place to start. The Mahindra Roxor is basically the turbodiesel 5-speed Willys of our childhood dreams. It’s not meant for ripping around the sand dunes in style or “flexing” on those high-dollar side-by-sides with six miles of suspension travel. This is for working on the farm, for towing heavy things around the stockyard, for crawling through mud pits, and for cruising the backroads to town covered in the evidence of the weekend’s adventures. 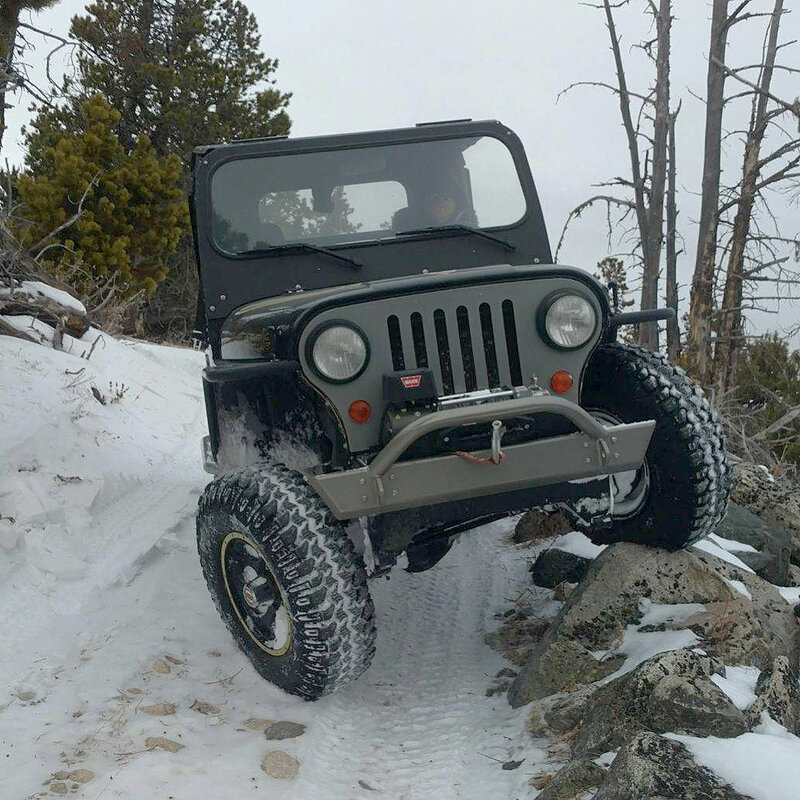 Tyson ends his review with an honest sentiment: “If you’re into Jeeps, I think this is a great base start to build a 4x4.” We couldn’t agree more – we think the Roxor’s mod-ability is one of its greatest strengths. The stock Roxor is a great platform, but its final form is up to you. Lift it on 35s and go mudding, remove the speed limiter and drive it on the highway, or leave it bone stock the way God and Mahindra intended. The choice is yours. YouTuber Abiez first broke the news on the upcoming changes to the 2019 Roxor back in November. Today he takes us to Valley Sport and Marine in Minot, North Dakota (and their second location in Bismarck) to review those changes in person and give the world its first look at the 2019 Mahindra Roxor up-close and in-person. Ever wonder where that pesky engine oil goes? In the radiator? In your cereal? Now there’s a “FILL ENGINE OIL HERE” sticker on the valve cover, so you’ll never be confused again. Exterior differences include “turbo diesel” stickers on the sides to make those vintage Jeep guys jealous, and a factory oil pan skid plate to protect the Roxor’s sensitive bits when driving off-road. The battery is now branded as a Roxor part, with 585 CCA and plenty of ports for accessory add-ons. The interior is mostly unchanged, save for a nice “Heritage” center cap that’s been added to the steering wheel. Our favorite automotive sticker of all time is still safely intact. Worryingly, the speed sensor situation has changed for the worse. Everything is done through the ECU now, and removing the new generation of speed sensor will throw codes and may cause the Roxor to enter Limp Mode. I guess the little trick of unplugging the speed sensor to disable the limiter ruffled Mahindra’s feathers. Whoops. To offset that, Mahindra is raising the Roxor’s factory speed limit from 45 MPH to 55 MPH. That should allow future Roxor owners to have a good amount of fun over any terrain they want. It also means the only option for exceeding 55 MPH is to tune the ECU. It’s a give and take. Other changes for the 2019 model year include increasing the size of the front brakes, renaming the existing color choices, adding new color choices, and adding more custom paint and bolt-on parts available through Roxor dealerships. Though we all know a tuned Roxor is faster than a stock one, this good old-fashioned street race from Instagram user @duramaxtuner proves that knowing is only half the battle. It’s an entirely different story to witness a 117-horsepower Roxor with an ECU tune pulling on a stock Roxor, with its comparatively measly 52 ponies. That’s over double the horsepower of a stock Roxor! With its engine roaring and coal rolling, this tuned Roxor pulls on its stock counterpart like it’s standing still. Christmas came and went in Louisiana, and YouTuber Red, White, & Roxor has some shiny new parts to show for it. Starting off the goodies are a set of Fuel Sledge wheels in 18x9 size with a -12mm offset. These wheels aren’t on the Roxor just yet, but he does mock them up and we have to say, they look fantastic. There aren’t a lot of choices for 5”x5.5” wheels (5”x 139.7mm) with the proper backspacing to keep the tires off the suspension components, but these Fuel wheels definitely fit the bill. RWR also discovered that the Roxor has a ½ x 20 thread pitch, for all your lug nut needs. Some seriously aggressive off-road tires are teased at the end of the video. We can’t wait to see how this all comes together. Keep us posted! We just added wheels, spacers, and accessories to the Wheels section of our Roxor Store. Go check them out! This has been Roxor Weekly, our weekly column on the best new Roxor videos the web has to offer. Johnny Law is getting stricter by the year, so don’t risk driving your Roxor illegally on public roads. Dirt Legal can get you a street legal title, license plate, and registration to help make your Mahindra Roxor street legal anywhere in the United States. Get a title in your name, registered to your home address, all in a matter of weeks. No inspections and no trips to the DMV.